The Ward application uses Ward's minimum variance method for clustering molecules based on molecular fingerprints or other descriptors. Murtagh's reciprocal nearest neighbor (RNN) algorithm is applied as a heuristic to achieve fast calculation times. Ward's clustering algorithm can be called as command line tool or by calling the Java class directly. command to call the algorithm. You can prepare and use the ward script or batch file as described in Preparing the Usage of JChem Batch Files and Shell Scripts. Because the utility has many parameters, it may be reasonable to create a shell script or a batch file for calling the software. If --cluster-count is not set, then RNN list is generated on output. Without a valid license key, the software is in demo mode and maximum 1000 structures can be retrieved from the database. 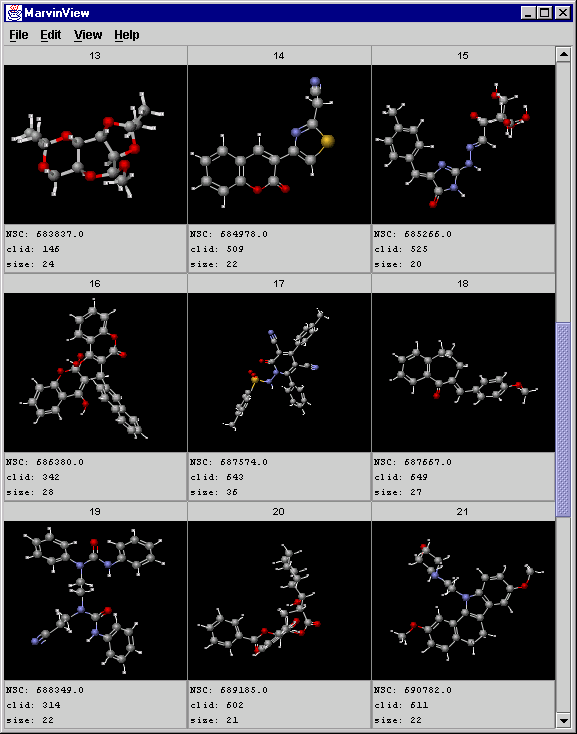 Pharmacophore fingerprints can be generated using the GenerateMD tool. These fingerprints are not binary, so they have to be specified as other descriptors. At least one binary fingerprint column or descriptor column is required. Use the --generate-id option if the id column is missing from the input data. An example for the XML configuration file can be found in the examples/config directory (examples\config for Windows users). In the case of text input, the delimiter between two numbers should be space or tab (comma is not allowed). 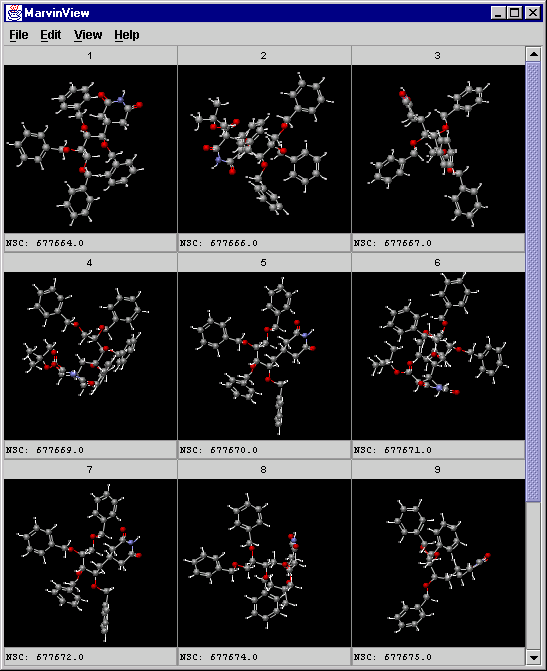 The cd_id and cd_fpi columns in JChem's structure tables are appropriate as input. (For the sake of readability only 6 fp. columns is applied in the above example, but usually this number is much higher.) You may also modify here the order of the results, as described in our FAQ. It is important to place the query statement between quotes because it contains spaces. The last column is written only if the --central option is specified. A central object has the smallest sum of dissimilarities to the other objects in the cluster. Central object calculation slows down the application significantly. The Id and Clid columns are the same as in the case of database output. A precondition of database output is the existence of a database table that contains the above columns. Create the database table before starting the calculation. The ? symbols will be substituted with the corresponding values. It is important to place the import statement between quotes because it contains spaces. --fingerprint-size: the number of binary fingerprint columns multiplied by 32 (because the bit-length of integer numbers is 32 in Java). --dimensions: specifies the number of other columns. If only binary fingerprints are used in the clustering process, then this parameter doesn't have to be set. --weights: when other columns are used, a weighted Euclidean distance calculation may be applied. If there are also binary fingerprint columns, weights are relative to the Tanimoto coefficient calculated from the binary fingerprints (the Tanimoto coefficient has a weight of 1.0). --cluster-count: the desired number of clusters. By default, the heap size in some Java runtime environments is limited to 64MB, so you may run out of memory easily. See the FAQ on increasing the heap size. The settings needed for the database connection are also modified and saved by JChemManager. If you successfully entered into the database using JChemManager, then you don't need to set connection for Ward manually. Hierarchic clustering techniques, like the Ward method, can cluster the set at any chosen hierarchy level. However, in most cases, there is no obvious way to select the optimal number of clusters. Using the --Kelley <filepath> option, an optimized hierarchy level can be calculated using the Kelley method and the resulting statistics is written into the specified file. where n is the number of elements in all clusters, kl is the number of clusters, AvSprl is the average spread of the cluster at level l and min(AvSpr) andmax(AvSpr) are the minimum and maximum of this value across all of the cluster levels. where N is the number of the members in the cluster, i and j are members of cluster m and dist(i,j) is the Euclidean distance between the two members i and j. Setting the --cluster-count option correctly, is important in fine tuning the clustering process. Since reciprocal nearest neighbor searching is much more time consuming than the clustering stage, it is reasonable to separate the two processes. In that case clustering can be run several times with different --cluster-count settings. If --cluster-count is not specified, Ward collects and stores the list of RNN pairs and their distances in a text file. If this file is fed into Ward, the RNN searching is omitted. When creating the RNN list without clustering, the --common, --statistics and the --only-statistics options are not available. set QUERY="SELECT cd_id, cd_fp1, cd_fp2, cd_fp3, cd_fp4, cd_fp5, cd_fp6, cd_fp7, cd_fp8, cd_fp9, cd_fp10, cd_fp11, cd_fp12, cd_fp13, cd_fp14, cd_fp15, cd_fp16 FROM structures WHERE cd_id < 10000"
QUERY="SELECT cd_id, cd_fp1, cd_fp2, cd_fp3, cd_fp4, cd_fp5, cd_fp6, cd_fp7, cd_fp8, cd_fp9, cd_fp10, cd_fp11, cd_fp12, cd_fp13, cd_fp14, cd_fp15, cd_fp16 FROM structures WHERE cd_id < 10000"
INSERT="INSERT INTO clusters(cd_id, cluster_id) VALUES(?,?)" Make sure that the clusters table exists and is empty before running the script. Testing different -c parameters. Using the output of an RNN list generation. Singletons get negative cluster ids. Clustering using the suggested number of clusters and the generated RNN list. Singletons get negative cluster ids.